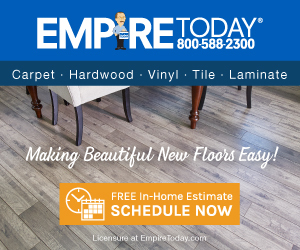 Next review Empire Today - I purchased new carpet, and they put in the wrong color. Oct 12, 2010 We apologize that you did not have a positive experience with our sales representative. I would like to follow back with you regarding your experience with your quote. There are many factors that go into our fully installed price including the product cost, padding, sales, floor preparation, square footage of the area, moving of furniture, etc. Could you please contact me directly at 888-588-2315 x4195 or email me at customersupport@empiretoday.com with your contact information and we will follow back with you. Rebekah Clerk, National Customer Service Manager. Thank God I didn't get past the salesmen. He was a weasel! He told me that the carpet I wanted was over $5 a square foot. I checked around and found the same exact carpet for $3.89 a square foot. When I confronted the salesman he argued with me. I told him to come pick up his samples and two weeks later he hasn't taken his junk carpet off of my front porch. In a couple of days my dog will be using it as a bed. I am glad I found this site. Stay away or do your homework! Review #133497 is a subjective opinion of User133497.